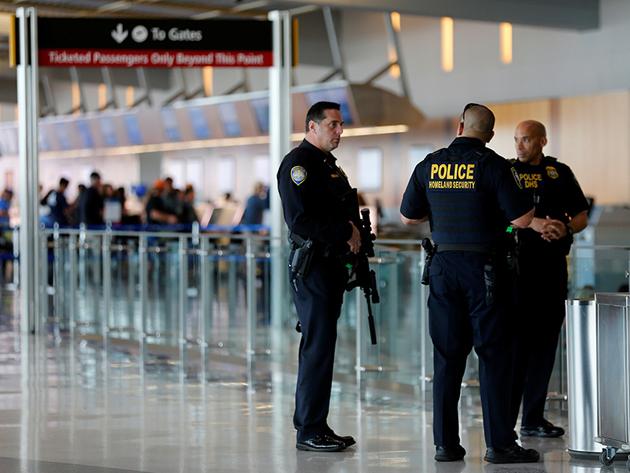 A San Diego Harbor police officer chats with Homeland Security officers while on patrol at Lindbergh Field airport in San Diego, Calif., on July 1, 2016. Photo courtesy of Reuters/Mike Blake *Editors: This photo may only be republished with RNS-MUSLIM-REGISTRY, originally transmitted on Nov. 22, 2016. (RNS) Nearly 200 religious and civil rights groups are petitioning President Obama to dismantle the regulatory framework behind a Homeland Security program critics say discriminates against Muslims and Arabs. President-elect Donald Trump has appointed one of the architects of the program, Kris Kobach, to his transition team. That and Trump’s own calls on the campaign trail for “extreme vetting” of immigrants have led some to believe that he will revive the National Security Exit-Entry Registration System. Created in the aftermath of 9/11, NSEERS was effectively canceled by Obama in 2011. It had required certain noncitizens who came to the U.S. from 25 mostly Muslim-majority nations to register with immigration officials. Obama reduced the number of countries under NSEERS rules from 25 to zero. But the framework for the program remains. The Council on American-Islamic Relations, the Church World Service, the Anti-Defamation League and the Sikh Coalition are among the groups that sent a letter to Obama on Monday (Nov. 21) denouncing the program and warning against its future use. Other signatories of the letter include the American Muslim Advisory Council, the American Civil Liberties Union, the Christian Church (Disciples of Christ) Refugee & Immigration Ministries, the Franciscan Action Network, the Jewish Council for Public Affairs and the Unitarian Universalist Service Committee.